Sometimes you need to dip a fried potato in a cup of chocolate ice cream and you don't want to leave the house to do it. Humanity has been facing this problem since we left the Garden, and until recently, it was unsolvable outside of guilt-tripping loved ones. But this is 2018. Now, you can not only get Wendy's delivered to you, you can get it delivered to you for free. 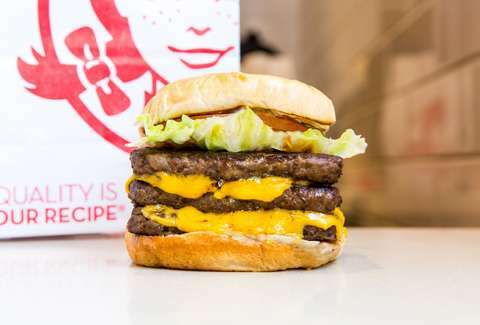 This giant step for mankind is courtesy of Wendy's new promotion, which gets you free delivery on Fridays, Saturdays, and Sundays until November 25, 2018. That's over a dozen weekends to turn your home into the Garden of Fast-Food Eden. Be warned, though, that this deal is only available for Wendy's orders of $10 or more made through DoorDash, the food delivery service. And it only applies if your area is eligible for delivery to begin with -- Wendy's has been expanding delivery so chances are better than ever. Just make the order through the DoorDash website or its app and the discount will be applied if you hit the minimum. Just consider the over $10 restriction an excuse to treat yourself. Even better yet, Frostys are only 50 cents right now.